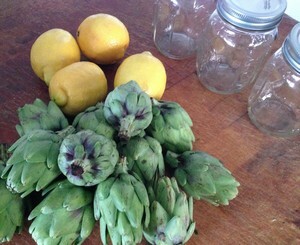 As you’ve probably figured out by now, the Accidental Locavore loves artichokes in all sizes and forms. Large, small, tiny, steamed, grilled, fried, raw, they’re all good. When I saw this recipe from Mrs. Wheelbarrow (you may or not remember her as the impetus behind Charcutepalooza), it was time to take a deep breath and pull out the Ball jars. Why the deep breath? A couple of reasons. First of all, my cousin Ellen makes amazing jam, so I usually leave all the canning stuff to her and just sit back and enjoy her hard work. The other reason is that canning is a bit dicey; do it wrong and bad things happen. But Mrs. Wheelbarrow had gotten me safely through a year of charcuterie, so I figured if I just faithfully followed the recipe, all would be good, and it was. Because it does require some attention, here’s the link to her recipe and I’ll just fill you in on how it turned out. My verdict: This isn’t hard at all and is really worth the effort. So much so, that the minute the 30 days were up (OK, it was 28 days, but hey…), I busted open one of the jars and promptly made a second batch. These are delicious! I thought the first batch was a little heavy on the white vinegar so with the second, I used ¾ cup of white vinegar and ½ cup of the white wine vinegar. Since it’s only been a couple of days, you’ll have to wait to see if that worked. 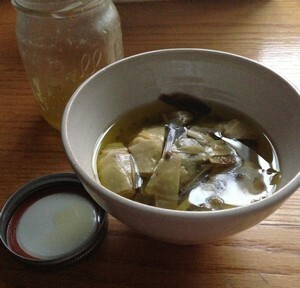 With both batches, I used small artichokes, mostly because they’re easier to prepare, since you don’t have to remove the choke. The only downside with this recipe is that you’ll be washing lots of pots, but if you’ve got a rainy afternoon, take an hour and try this. If you can manage to hold onto a jar or two, sometime in the fall or winter, you’ll be so glad you did!